Welcome to our Lil Red Express Truck photo collection. This section contains The internets largest collection of pictures of these cool Mopars. All photos in this collection were taken by the staff of the 440magnum Mopar Enthusiast Network. Photos are from past Mopar shows and events, including Mopar Nationals, Chrysler Classic’s and more. 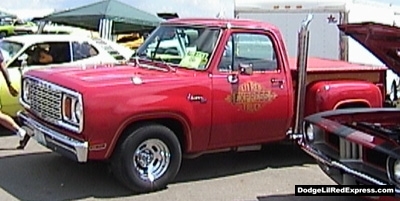 Above: Dodge Lil Red Express, photo from the 2000 Chrysler Classic Columbus, Ohio. 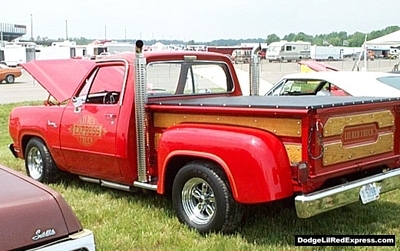 Above: 1978 Dodge Lil Red Express Truck, photo from the 2000 Mopar Nationals Columbus, Ohio. NOTE: All images in the Dodge Lil Red Express Truck Photo Gallery are the exclusive property of DodgeLilRedExpress.com and may not be reproduced, copied or manipulated in part or entirety without written approval. They may not be posted to other web sites or pages without written permission from the DodgeLilRedExpress.com web site.